A High Court judge has ruled that doctors can withhold treatment if baby Luke Winston-Jones' condition worsens. Doctors say it would not be in Luke's best interests to be resuscitated if he stops breathing again, but his mother Ruth says she wants his treatment to continue. 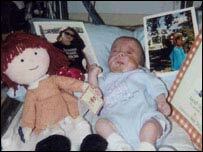 The case follows that of Charlotte Wyatt, where doctors and the family also disagreed over what was best for the baby. In Charlotte's case, the High Court judge backed the doctors treating the 11-month-old baby, who wanted permission not to resuscitate her as her quality of life would be so poor. Q: What is wrong with Luke? He has Edwards syndrome, a severe chromosome abnormality where an extra chromosome 18 is present in every cell. Babies born with the disease have an average life span of less than two months with fewer than 10% surviving more than a year. Characteristic features of Edwards syndrome include growth deficiency, low-set and malformed ears, clenched hands, bone abnormalities, hernias, skin mottling, heart defects, feeding and breathing problems in infancy and learning disability. Luke was born by emergency Caesarean at Ysbyty Gwynedd Hospital, Bangor, on 30 January. Due to his serious cardiac defects, including two holes in the heart, he was moved to Alder Hey children's hospital in Liverpool. He has suffered cardio-respiratory arrests and required resuscitation. Doctors say Luke is seriously ill.
Why has the case gone the High Court? The medical team treating Luke at Alder Hey Hospital in Liverpool believe it would not be in Luke's best interests to resuscitate him if he stops breathing. The doctors want to be able to let Luke die should his condition get worse, as they say treatment for him may become increasingly aggressive. However, his mother Ruth has argued her son should continue to receive treatment. Dame Elizabeth Butler-Sloss, president of the High Court Family Division, ruled in favour of the doctors' request. Q: Is Luke's situation the same as Charlotte Wyatt's ? The babies are affected by different conditions, but the issues in both cases are the same. Charlotte was born 11 months ago when her mother was 26 weeks pregnant and now has serious heart and lung problems. She has never left hospital and is fed through a tube. She also needs a constant supply of oxygen. She has stopped breathing three times and each time she has been resuscitated. Doctors at the Portsmouth Hospitals NHS Trust said they believed if she stopped breathing again they should not revive her as her quality of life would be so poor and her life would be dominated by pain. But her parents, Darren and Debbie, disagreed, saying she deserved every chance. As the two sides could not agree, the case ended up in court. Q: Don't parents have the final say on treatment? No. Doctors can refuse to treat a person if they feel the treatment serves no purpose or if the quality of life is deemed to be so low that it is not in the patient's interest. However, if the family and doctors disagree it is left to the High Court to decide. Q: Was Charlotte's case the first of its kind? It was not the first time doctors and parents have gone to court in these situations but previous hearings have been held in private. Both Charlotte's parents and the Portsmouth Hospitals NHS Trust agreed to it being held in the open court because they felt it was in the public interest. Luke's case is the second to be heard in this way. Q: Are we likely to see anymore cases similar to this one? Perhaps. Some believe that with medicine advancing so quickly society is going to have to answer more of these dilemmas. Doctors can now keep premature babies alive even when they are born three months early and seriously ill people can survive for longer than they have ever been able to. But the developments mean doctors, patients and their families have to ask themselves whether the future quality of life warrants it. When should treatment be stopped?